The 4.2-liter V8 TDI diesel engine is based on the 4.0-liter version. The first V8 TDI was installed in Audi A8 in 1999, and it was the 3.3-liter version. The 4.2-liter engine is the last generation of the V8 TDI series. The engine has cast iron cylinder block with the same bore spacing 90 mm and 90 degrees V-shaped configuration as the 4.0-liter version. The engine got forged steel crankshaft. The cylinder heads have the similar design as 3.0l V6 TDI heads. They are made of aluminum alloy, have four valves per cylinder, two camshafts, hydraulic tappets/lifters. The engine has single-row timing chains installed in the rear end of the engine. That makes very difficult to replace them. The V8 TDI has the Common Rail fuel injection system. That allows reducing the fuel consumption and emissions. For more power output, the engine was equipped with two last generation turbochargers Garrett GT17 (pressure is about 2.5 bars), one for each header. 1. 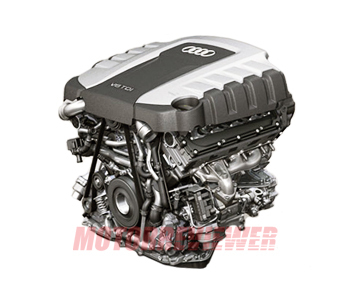 The V8 4.2 TDI diesel engines are excellent concerning reliability. However, some of them had problems with the intake manifold and throttle. 2. All bearing of axes, rods, and levers inside were made of plastic until 2009, which wear out very quickly (40-50,000 miles). As a result, reduced power and torque because of different gaps and skews. New ones replaced this weak parts later, and problems with them never happened again. BNV - 326 hp and 479 lbf ft version Audi D3 A8 4.2 TDI Quattro from July 2005. BTR - 326 hp and 561 lbf ft engine for Audi Q7 4.2 TDI. CEM - 349 hp and 590 lbf ft engine for Volkswagen Marine TDI 350-8.